After being sick for a week and consuming a diet of chicken soup and toast, I feared I wouldn’t have anything to post. And then I thought of the soup itself. It’s such a simple recipe, and you can take advantage of convenience items like rotisserie chicken and chicken stock when you really have no energy to cook and wash extra dishes. I learned a few lessons from this past bout of sickness. Lesson One: no matter how lazy I feel, go to the second store to pick up the rotisserie chicken (I chose to buy and poach chicken breasts instead…not much extra work under ordinary circumstances, but when ill, I practically needed a nap after this step). Lesson Two: Do NOT try to do math in my head when my head feels like it will explode at any moment. Use a calculator, or else I will keep adding 32 and 14 and getting 64. And then I will realize my mistake and decide to just add water to rectify the chicken stock shortage, resulting in a soup with no flavor. Ah, well. When made correctly, this soup delivers comfort in a bowl. Heat oil in large pot (about 5 or 6 qt size) over medium heat. Add onions and saute until soft, about five minutes. Add carrots and celery and saute for another two minutes. Add chicken stock, cover and bring to a boil. Reduce heat to low and simmer for fifteen minutes. Remove cover and add chicken, parsley, and thyme. Cook for about three minutes to allow flavors to meld. Turn off heat and add noodles. Allow the soup to sit for five minutes so the noodles can absorb the stock. Test for seasoning and add salt and pepper to taste. I had to laugh over your lessons! LOL you poor thing. I sure hope you are feeling better!! I’m doing much better now, thanks! I am feeling better now thanks! We’ve had our first confirmed case of Swine flu in my oldest sons class and although they no longer treat it here unless it’s really bad, Im still worried when and if we are going to get it. The latest prediction I read was that it’s possible one out of every three people could become infected. That sounds absolutely delightful. 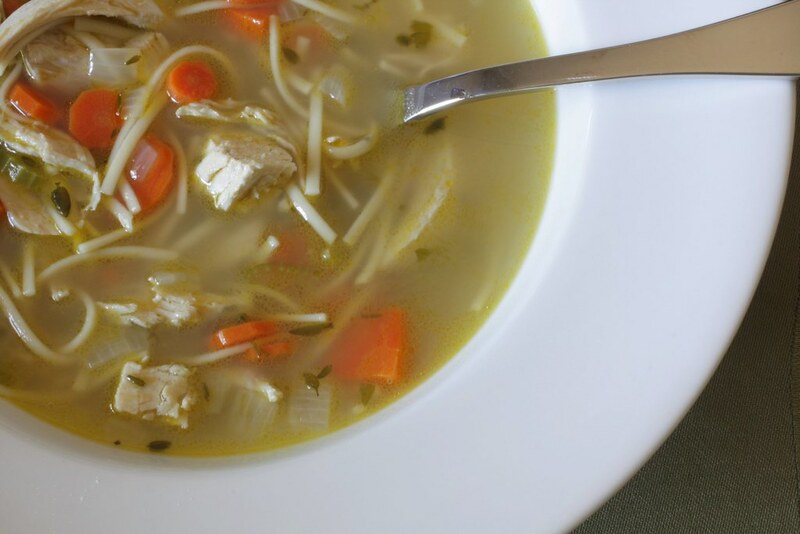 I just came off a diet of chicken soup too – being sick is no fun!